After posting my recipe for Steamed Oysters with Black Bean and Scallion Sauce, I realized it was about time I discussed some of the thick black sauces I have in my kitchen. According to Wikipedia, Chinese black bean sauce is "made by fermenting and salting soy beans. The process turns the beans black, soft, and mostly dry. The flavor is sharp, pungent, and spicy in smell, with a taste that is salty and somewhat bitter and sweet." I have to admit, I cook the least with black bean sauce. I use it in addition to other sauces, and usually when I'm marinating meats. It's the saltiest of the three sauces, with hoisin sauce tasting a tad sweet. My favorite of the three to cook with is oyster sauce. Also, notice I prefer Lee Kum Kee brand. There's a reason for that. According to Wikipedia, "Oyster sauce is prepared from oysters, brine, and umami flavor enhancers such as MSG, and typically contains preservatives to increase its shelf life. The sauce was invented in 1888 by Mr. Lee Kam Sheung, in Nam Shui Village in Guangdong province, China. His company, Lee Kum Kee, continues to produce oyster sauce, to this day, along with a wide variety of Asian condiments." In case you're concerned about eating locally or of the quality of imported goods from China, Lee Kum Kee sauces are made in the USA, in the city of Industry. They even have a distribution center on Date Avenue in Alhambra if you want to eat even more locally. I cook with oyster sauce the most, using it in fried rice, as a marinade, for stir-fries, or to make sauces. If you've never had oyster sauce, I'd say the taste is of very concentrated oysters. Think of how concentrated smoked oysters taste, but in a sauce form. For vegetarians, there's a mushroom sauce equivalent that may be used instead. Lee Kum Kee is widely available, but if you can't find it, make sure there's actually oyster extract on the ingredients list. I've sometimes used Thai oyster sauces with good results too but don't have any specific brand recommendations for that. As for hoisin sauce, I usually only use it as a side accompaniment when I make Pho Bo (Vietnamese Beef Noodle Soup). And in fact, in Vietnamese, it says tuong an pho (sauce for eating pho). I prefer fish sauce for dipping Goi Cuon (Vietnamese Salad Rolls), although hoisin dipping sauces are popular too. For Chinese cooking, I've used it in marinades and for stir-fries, but that's usually in addition to oyster sauce. Hoisin sauce is commonly used for Peking duck, barbecue (it's one of the ingredients in my recipe for Char Siu (Chinese Barbecued Pork), and moo shu pork. The sauce is sweet potato-based with sugar, water, soybeans, salt, sesame seeds, garlic, wheat flour, chili pepper, and spices. All these sauces should be stored in the refrigerator after opening. And because of Mochachocolata-Rita, I've now added to my pantry Indonesian kecap manis (Some say this is where the word ketchup comes from.). There were actually three kinds at the San Gabriel Superstore. I ended up buying the red label. After I got home and double-checked her blog, it was the exact same bottle as on her masthead. Subliminal messaging! 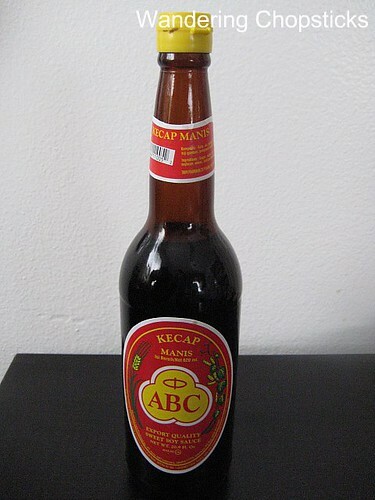 According to Wikipedia, Kecap manis is an Indonesian "Sweet soy sauce, which has a thick, almost syrupy consistency and a pronounced sweet, treacle-like flavor due to generous addition of palm sugar. It is a unique variety; in a pinch, it may be replaced by molasses with a little vegetable stock stirred in." It actually does have a molasses-like consistency and flavor. If you've been intimidated by caramelizing sugar for kho (Vietnamese braised dishes), then you can use a little kecap manis for color and sweetness. Unlike the other sauces, kecap manis may be stored at room temperature. I've only recently started to cook with kecap manis so I'll post those recipes later. 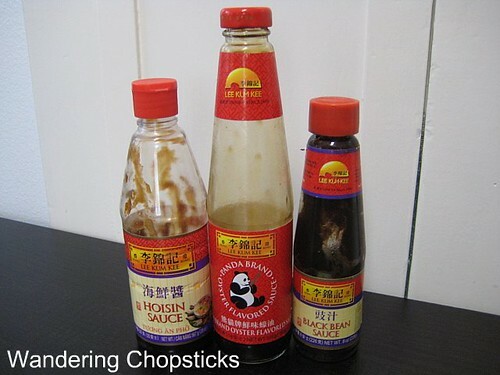 While the four sauces are slightly different from one another, their similarities in regards to the thick black viscousness means that they may be substituted for each other. Of course, you'd need to make adjustments of sugar and salt depending on which sauce you use. With the exception of oyster sauce, the black bean, hoisin, and kecap manis sauces are appropriate for vegetarians. 1 year ago today, my first blogging gift, a handmade apron. ahh.. My must have sauces too!!! Seriously! What is cooking without them?? Esp oyster sauce! I can't live without oyster sauce too. Black bean is my favourite especially steamed with spare ribs! I'm not trying to make you do the research, but I read through your posts often and was wondering if you had what would be an "Essential Ingredients" list, pantry or fridge. Which ones should I stock up on so that I can have them handy to make something delicious at home? I finally found an Asian Market within an hour from my location, so I'd like to know what I should look for. If you've already answered this, many apologies; just point me where I need to go. It says to refrigerate after opening, so I refrigerate after opening. :) Just to be on the safe side. I think every Chinese cook has to have these in their kitchen for sure. Steamed spare ribs with black bean sauce is a must every time I go out for dim sum. I've been working on precisely what you're asking, compiling a lot of my "basics" from the pantry to the fridge. Until then, click on the category tag for "Peek in my Kitchen," and you'll find similar posts to this one. A brief discussion of what they are, background info, and the dishes that I cook using these various items. Hope that helps. Ha! It won't replace fish sauce in my kitchen, but you love it so much that I figured I'd try it out. Hoisin sauce is my new best friend. A few months ago I used it in an super-easy stir fry recipe I got on Epicurious. I keep changing the recipe by using different meats and adding veggies. To me it is total comfort food. It tastes so good, I feel like it is cheating that it is so easy to make. Ah! Kecap Manis. You know I had to comment. It's used in many apps, of course. But here's a simple one. Soak bamboo skewers in water overnight. Cut up lamb meat into postage stamp size squares. Thread onto the skewers. On a wide plate, the kecap manis, squeeze lime juice, and white pepper. Mix throughly with a spoon. Use a teaspoon of lime juice and a dash of white pepper per tablespoon of kecap manis. Grill the skewered lamb over white hot coals. until the meat turns pallid and opaque. Remove from the fire and coat with the kecap manis mixture. Put back on the fire and grill until browned and glistening. Eat immediately with more of the kecap manis mixture (a clean batch you didn't use to glaze with). Thank you for the response. I anxiously await your list. That's really the secret, choosing which sauce you prefer. Everything else is easy enough to switch around. Another black bean sauce lover. I'll have to experiment with it more. I just keep falling back on oyster sauce. Ooooh, a great Indonesian recipe. So easy. I'll have to try it soon.